From the film "Comedy Of Terrors" released in 1964. This poster was sent to theatres to be displayed in the lobby to promote the film's engagement. This poster is rolled and on heavy stock paper, it has never been folded. The poster has some wear and measures 40x60 inches. 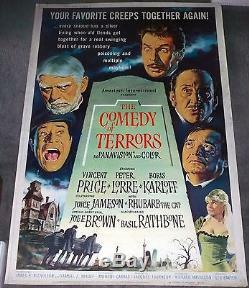 The item "COMEDY OF TERRORS original 40x60 poster VINCENT PRICE/BORIS KARLOFF/PETER LORRE" is in sale since Monday, November 29, 2010.